Now it starts, now it starts! Ride out of the temple and draw your sword with the -button to see the reflection of the sunlight on your sword. Follow the ray of light reflecting from your sword to where the light is bundled the densest. It is not that hard to find the first colossus as you just have to exit the temple and then ride straight on to the south. 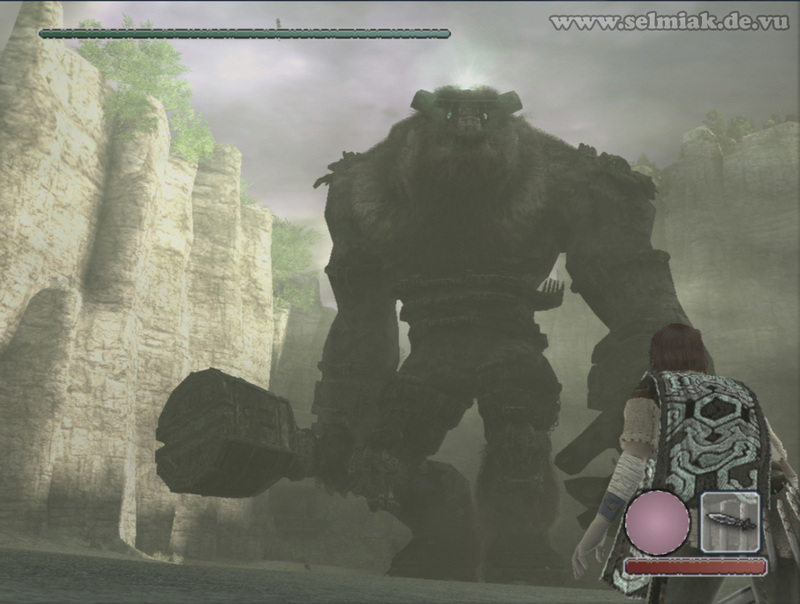 Pass through a small valley with some trees and once you are at the foot of the mountains you are right on track as the first colossus is waiting for you up there and is ready to smash you into the ground. So let's get into the fight. 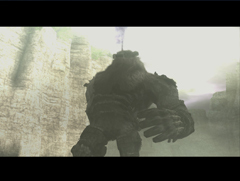 The first thing you will learn now is a basic element fo the gameplay in Shadow of the Colossus, that is the -Button. While holding you grab onto all rough and edgy surfaces, the red circle empties over time and once it is completely empty Wander lost all his strength for now and loses grip and just falls down to wherever he will land below. But as long as you keep pressing and a small bit of red energy is still in the circle nothing will happen. So jump to the ivy and grab onto it and climb up. Press the -button to jump over the edge. The longer you press the button before releasing it the stronger you jump and the higher you jump. After this we have to play a little parcours game and jump and duck over and under obstacles until reaching the tower. Climb up on the right side of the tower and then jump towards the tower from the right side. Grab onto the ledge of the tower and keep holding on. Now you can climb around the tower while still grabbing onto it. Now position the camera behind you, get into the jumping stance with pressing the button while still holding down . While the strength circle loads up on white jump energy pull the left Analog Stick back. 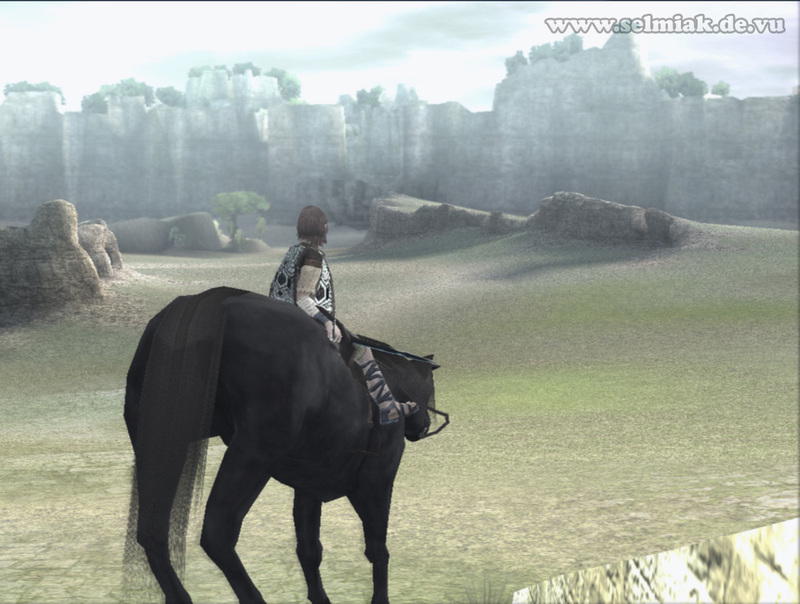 You can see Wander frees one hand, turns around a bit and leans backwards. This is the moment to release the jump button to jump over the gap while still holding to land safely on the other side. Pull yourself up over the ledge with the button and you learned a new move. And you now are only a few steps away from the first colossus. Enjoy this really strange and unknown and breathtaking moment while the huge giant stomps past you while you are hiding in awe behind that rock. This is the first colossus. Okay, now let's get to another important point. You now have to take down this colossal Colossus with aimed strikes from you sword. Sounds overwhelming but is great fun actually. Draw you sword and let the sun reflect from it like you did when you were searching for the direction to go to. Now aim the reflecting sunlight onto the colossus and search around on him and his weak points will be revealed. The weak points are exactly there where the sunrays are bundled the densest and your controller starts to vibrate. 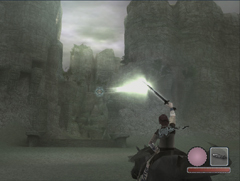 Most of the colossi have 2 weak points you have to find and in case you selected the sword as your weapon they are shown as light blue ornaments. So let's face the fact we have to take this beast down now. So you better read on to find out how. 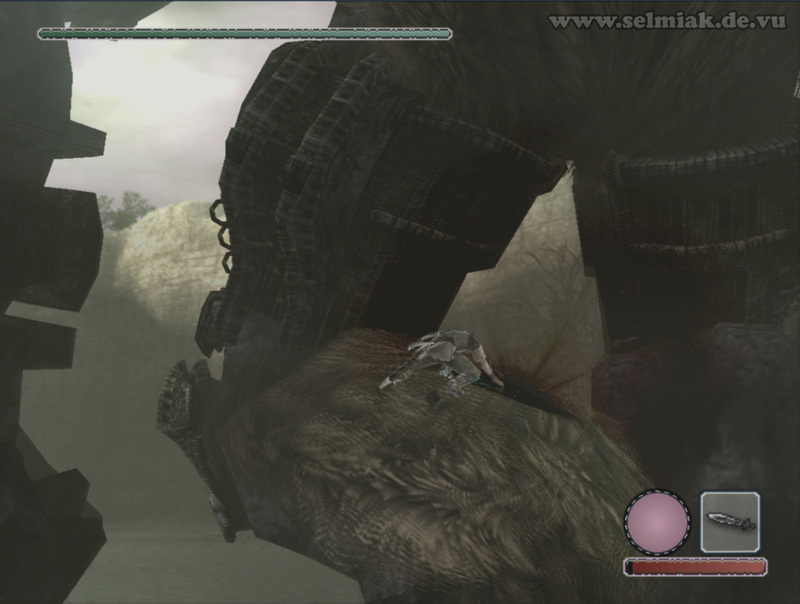 As this is the first colossus the difficulty level is not that high yet so his weak are on his head and on the back of his left foot. Avoid his stomping and smashing attacks and find a way behind his left food. So just jump onto his food from behind and grab onto the fur there. Don't let him shake you off. Make sure you have selected the sword as a weapon (change it with the directional pad left or right) and climb into a position directly above the glowing ornament in the back of his foot. So if you hit weak point of the 1st colossus with the button (square) this hurts the colossus and he knees down. This is the right time for you so get up and climb up on his back until you reach his shoulders. Grab onto his fur there and climb on until you reach his colossal huge head. When you can see the ornament on his head position yourself in the middle over it so you can perfectly strike it with a blow and there you go crush your sword into his ugly old stinky head. Use the -button to crush your sword deep into his weak flesh (or whatever he consists of) while you are hanging on the back of his head like a small flea. If you only tap the cut will not be as effective as when you press the button once and the keep calm to charge your powers for the cut. Watch how the circle in the lower right fills with white color. This is your charging power. Once the circle is completely filled hit again to release the blow with full power. 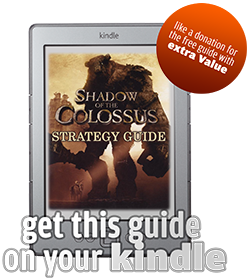 But watch out, the first colossus shakes a lot and if you are shaken too much you will lose all your charged power while your grabbing powers also decrease. 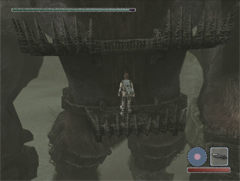 But of course the 1st colossus will try to get you off of him but you are lucky, he only has very short arms and so the only thing for him to do is shaking. Grab on tight and always watch your grabbing powers (the remaining red in the small circle in the lower right edge). If your grabbing powers are very low just lose your grab and try to stand on his shoulder while he isn't shaking and charge up. If you fail you will fall and have to climb up again. 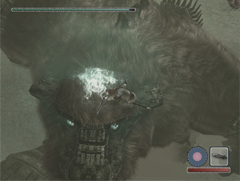 This can happen on every colossus, so just get back onto his leg and make him kneel again to climb up again and finish him off. After slamming the sword into his head for a few times and spilling a lot of black blood you should have defeated him and wake up in the temple again.